In a recent case before a California court of appeals, the plaintiff argued that a national fraternity was liable for injuries she suffered at a frat party. According to the court’s opinion, the plaintiff was injured when she fell off a makeshift dance platform at the party. The party was hosted by a local chapter of the national fraternity. She filed suit against the national fraternity for negligence, and a trial court granted summary judgment in favor of the fraternity. The issue before the court of appeals was whether the national fraternity had a duty to protect the plaintiff. In a claim for negligence, a plaintiff must prove duty, breach, causation, and damages. Everyone normally has a general duty to exercise reasonable care to avoid injuring others. However, there is no duty to protect others from the conduct of third parties, although there are exceptions to that rule. Under California personal injury law, the owner of a dog that bites or injures another person may be held liable for the injuries caused by their animal. However, the manner in which a California dog bite victim must go about in proving their case depends on the facts surrounding the accident. There are two basic types of California dog bite cases, those brought under a theory of strict liability and those brought under the theory of negligence. California imposes strict liability on dog owners whose animals bite another person in a public place or in any other place that the victim is legally permitted to be. Importantly, this means that the dog bite victim does not need to show that the animal’s owner knew that their pet was dangerous or that the animal had attacked someone in the past. 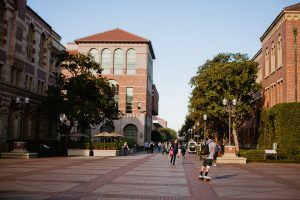 In a recent California personal injury case, a student brought a negligence claim against the University of Southern California (USC) for injuries she suffered at a fraternity party. The student, who was not attending USC, was apparently attending a fraternity party near USC and was dancing on a makeshift platform when another person bumped into her. The student fell and suffered serious injuries as a result. The student claimed that USC had a duty to protect her from an unreasonable risk of harm and that the University failed to protect her by failing to shut down or prevent the party. A California personal injury case brought under the theory of negligence requires the injury victim to show that the defendant owed a duty of care toward the plaintiff. Generally, every person has a duty to exercise reasonable care to avoid injuring others. However, a person who does not create a risk does not typically have a duty to protect others from harm. And generally, a person does not have to protect individuals from the conduct of third parties. In certain cases, there may be a duty to protect others from the conduct of third parties, such as where someone undertakes the duty of protecting another person or where a special relationship exists. For young students, schools not only serve as a place of learning, but also provide essential oversight and supervision to children who are too young to care for themselves. Of course, as students get older, they can care for themselves. However, they still spend a significant portion of their time on campus. Thus, the duty that colleges and universities have to their students is the subject of much discussion and debate. Recently, a state appellate court issued an opinion in a California school injury case discussing the duty a state college has to its students. While the case involved the intentional conduct of another student, the most important part of the opinion was the language discussing the school’s duty to students. According to the court’s opinion, the plaintiff was attacked by another student with a knife. Evidently, the student who attacked the plaintiff had a documented history of mental health issues, and had explained to numerous staff members that he felt as though his fellow students were out to get him. In one example, the student claimed to have overheard fellow students plotting to shoot him. Earlier this year, a California appellate court considered a case brought against a public college by a visiting athlete. The court ultimately concluded that the public college was not entitled to immunity and allowed the plaintiff’s case to proceed. According to the court’s opinion, the plaintiff, a student-athlete at a public college in the Los Angeles area, was participating in a volleyball tournament at another public college in California. During the tournament, the plaintiff was injured during a game when she dove into the sand and hit a rock. The athlete filed a lawsuit against the host college, alleging that she was injured by a dangerous condition on the college’s property. The host college claimed that it could not be held liable for the injury because it was protected by immunity. Governmental immunity prevents people from suing the government in certain situations, by making the government immune from lawsuits. Immunity is often afforded to federal, state, and local governments, as well as government-operated organizations. One of the benefits of living in California is that many parts of the state have great weather. Due to the pleasant conditions, lots of restaurants have outdoor patio seating for patrons to enjoy their meals under the sun. However, sometimes disaster strikes. In this case, a woman was eating lunch on the patio of a restaurant when she was bit by a spider, which was later discovered to be a black widow spider. After being hospitalized with weakness and numbness due to the injuries, the woman who was bitten sued the restaurant where the bite occurred for damages. If you have been hurt in any way while on the premises of another individual or a business, they may be liable for your injuries. That’s why it is so important to contact a skilled Southern California premises liability attorney as soon as possible if you are injured, even if at first it may not seem to be the fault of the establishment. The main legal concept in this case is negligence. In order to prevail on a negligence claim, the plaintiff must prove that the negligent party had a duty to them that it breached. Generally, businesses and individuals have a duty to act reasonably under the circumstances. What is and is not reasonable is usually a question for the jury. The jury looks at all the facts of the case and then decides whether the defendant’s behavior was reasonable or not. There are some areas where the law has specifically carved out exceptions, but generally the concepts of negligence law will apply. A plaintiff sued Wal-Mart for injuries she sustained at one of Wal-Mart’s stores while acting within the course and scope of her employment with Acosta, Inc. The trial court found Wal-Mart liable for the plaintiff’s injuries. Under California Labor Code sections 3852 and 3856, appellant Hartford Accident & Indemnity Company (Hartford) applied for a lien on the plaintiff’s judgment to obtain reimbursement for the California workers’ compensation benefits it paid her. Although the judgment included compensation for her medical expenses, it did not include compensation for her lost wages. The court granted Hartford a lien on the judgment but reduced the lien amount.In August 2012, the plaintiff was working for Acosta when she fell and injured herself on Wal-Mart’s premises. Hartford was Acosta’s workers’ compensation insurer and paid the victim more than $152,000 in benefits, including more than $115,000 in medical expenses and roughly $37,000 in temporary disability indemnity for her lost wages. In July 2014, following a three-day bench trial, the court found Wal-Mart 100 percent at fault and entered judgment against Wal-Mart for $355,000, including $178,000 in past medical expenses, $102,000 in future medical expenses, and $75,000 in past and future pain and suffering. Although the complaint sought lost wages and earning capacity, the court did not award her damages for these items because she did not ask for them at trial. Hartford filed a notice and application for a lien on the judgment, based on the workers’ compensation benefits it paid to the victim. The trial court issued an order to show cause why it should not grant the requested lien. The plaintiff filed an opposition, arguing the court should reduce the lien amount by the nearly $37,000 Hartford sought for the temporary disability benefits it paid because she did not present evidence regarding those payments at trial, and therefore the court did not award her that amount as damages. A plaintiff was hit by a car as he crossed a street between defendant Grace Family Church and the church’s parking lot. He sued the church for negligence, alleging that the church was negligent in breaching its duty of care to help him safely cross the street. The trial court granted the church’s motion for summary judgment. The Third District Court of Appeal reversed the trial court’s decision in this California premises liability case, and last month, the California Supreme Court reversed the appeals court’s decision and remanded the case.In his initial lawsuit, the plaintiff alleged that the church owed him a duty of care to help him cross the street. The church responded that it had no control over the public street and thus did not owe a duty to prevent the plaintiff’s injury, contending that landowners have no duty to protect others from dangers on adjacent streets unless the owner created the danger. Before the state supreme court, the parties stipulated that the church did not control the street and did not create the dangers on the street. But the church, the plaintiff argued, by directing the plaintiff to park there, foreseeably increased the likelihood that the plaintiff would cross the street and become injured. Thus, the circumstances differed from those in which a landowner simply owns property next to a public street. California Civil Code section 1714(a) establishes the general duty that each person must exercise reasonable care for the safety of others. The California Supreme Court has held that courts should create an exception to this rule only when supported by public policy. The plaintiff sued defendant Target for injuries due to the defendant’s negligence. The plaintiff claimed she was cut by a plastic price tag holder that was sticking out into the aisle. The jury returned a verdict in the defendant’s favor, finding there was no dangerous condition. Finding that the appellate record and the plaintiff’s briefs were inadequate for appellate review, the Second District Court of Appeal affirmed in this California premises liability case.At trial, the plaintiff’s husband testified that he and his wife were shopping at the Burbank Target in September 2010. As the plaintiff was pushing her cart through the shoe department, she cut her pinky finger on a price tag sign that was extending horizontally into the aisle. The plaintiff attempted to complete an incident report but was told by the defendant’s staff that there were no blank forms for her to complete. Her husband later called the store to report the incident and left a message, but his call was never returned. The defendant’s employees testified that a guest would not be denied a guest incident report and that a report would have been completed by the defendant’s staff if an incident was reported and the guest did not wish to complete a form. There was no report completed by anyone for the alleged incident. They also testified to their procedures of sweeping for hazards in the store and stated that it was impossible for a price tag sign to extend horizontally into an aisle. The defendant also produced a mechanical engineering expert, who testified that it was impossible for plastic signs to extend horizontally into the aisle and that they were not sharp enough to cause a laceration. A medical expert also testified that the plaintiff’s injuries were not consistent with her claims in this case. On October 1, 2017, a gunman opened fire on a crowd of concertgoers at the Route 91 Harvest music festival on the Las Vegas strip. The gunman fired hundreds of rifle rounds from his suite on the 32nd floor of the Mandalay Bay hotel. The shooting left 58 people dead and 546 injured, making it the deadliest mass shooting committed by an individual in the United States. A California college student who was injured at the shooting recently filed suit against the concert promoter, the Mandalay Bay hotel owners, and the bump stock manufacturers. The case may have some relevance to certain California premises liability cases that may arise in these tragic situations.The lawsuit claims that MGM Resorts International, which owns both the hotel and the concert venue, failed to respond in a timely manner to the shooting of a hotel security officer who had gone to the 32nd floor to check on an alert from another guest room and who was shot six minutes before the massacre began. The lawsuit also questions why hotel staff failed to notice the gunman’s behavior prior to the mass shooting. Specifically, the plaintiff claims that MGM Resorts and concert promoter Live Nation breached their duty of reasonable care and knew or should have known that it was reasonably foreseeable that a breach of their duty to keep the concert venue safe could result in serious or fatal injuries to concert attendees. Specifically, the gunman brought in 10 suitcases of weapons and over 500 rounds, and he barricaded himself in his room without any staff noticing. The victim was shot in the arm by one of the gunman’s bullets and was thereafter rendered physically incapacitated, resulting in her being trampled by fleeing concertgoers. She was ultimately rescued by a kind stranger and transported to the hospital.